I spent most of today in this very spot, staring at this very print. In fact, it was the subject of today’s photo for my 365 project. I had a couple of maintenance requests to fulfill for my lovely past clients, and I finished up both a logo and a new website so I spend most of the day at my desk. It’s nice to wrap things up, but I’m also getting more and more nervous about my calendar in May, sparsely filled with only a couple upcoming projects, just at a time when we are most going to need my extra income. This print is a piece of birth art from an artist mama I met down here. 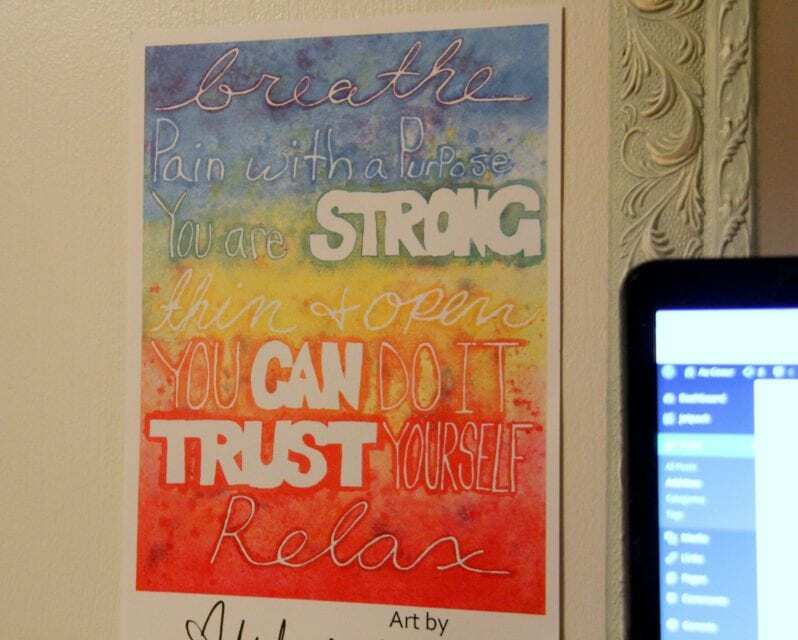 I thought it was beautiful and inspiring even beyond the labor room (or birth tub), so I hung it behind my computer. It’s nice to have a little reminder to breathe and relax when I start to feel myself slipping into darkness. At the end of March, we got some bad and incredibly frustrating news regarding out house up in Gillette. Before we moved down to Colorado, I worked very hard to make the house visible and to get it sold. You may remember the goofy memes I created for Facebook and that we held open houses four weekends in a row. Then, just as things were getting down to the wire, we found an interested buyer. She hadn’t yet been approved for a mortgage, but she was in the process, was able to give us a significant portion down, and was interested in rent-to-own. We can’t afford to carry two house payments (mortgage+rent), so we decided to work with her. We consulted an attorney to make sure we were doing everything right and protecting ourselves; upon his advice, we switched from rent-to-own and drew up a contract for deed instead. Just before the first of February, we met her at the attorney’s office, signed paperwork, collected the first month’s rent — more than enough to cover our mortgage — and breathed a sigh of relief. By mid-March we were jumping for joy when our buyer told us she had gotten approved for her mortgage much sooner than expected. It felt like everything was falling into place. We took our tax return and some of our savings and paid off our car ahead of schedule I made my big 30 Before 30 plan. Life was grand — and then it wasn’t. When our buyer’s bank ran the title search on our house, they saw the “Notice of Agreement for Warranty Deed” that had been filed by the attorney, and to them it looked like she already partially owned the house. Suddenly she no longer qualified for a new home loan. All they would give her was a refinance loan that required a huge percentage down, and just like that, they told us that she would never be able to buy our specific house. The contract for deed, advocated to us by an attorney and for which we paid more than $1000, became the one thing that was stopping us from selling the house. We went through all the classic stages of grief. Denial. Bargaining. Anger. Depression. Then, before we could move onto acceptance, the final shoe dropped: buyer decided that with no chance of owning our home she wasn’t going to hang around and wait for us to sell it. She paid through the end of this month, packed up her things, and moved out. I haven’t been writing much because I have been too busy grappling with the reality of this situation. In 15 days, we will have two house payments and two sets of utilities payments, not to mention a house we are trying to sell that will need regular paid-for lawn care and looking after, and which we bought so recently that we can’t really afford to hire a realtor. There are so many things about this situation that are impossible. There are so many things about it that I wish I could change, if only I had known at the time; so many decisions I wish I could take back (right up to buying the darn thing), and so many people I wish I could kick. But I don’t swear (actually, this is probably the first curse word I have ever written here, and even now I’m barely restraining myself from deleting it). I know there’s nothing productive in it — no matter how good it would feel — so I take a deep breath. I look at my birth poster, just as applicable to my life right now, and tell myself, Breathe. You can do it. You are strong. Everything has a purpose. Relax. Best of luck, Amber!! More website clients will come your way. You are very talented to have your flourishing business and to work from home. Are you going to use a realtor to help sell your house (to safeguard yourselves this time)? Thanks, Donna. The unfortunate thing is I just don’t think we can use a realtor. We don’t have ton of equity in the house, so the 6% fee most realtors charge would be killer. We would have to pay something like $15,000 out of pocket to pay their fee if we were to sell it for the price for which we bought, or we would need to jack the price up so high that I doubt it would sell. We thought about just using it as a rental for the next couple of years, but with our mortgage we aren’t allowed to do that. It’s a bad situation.